Mooger5 wrote: Did you run the Test Mode as described on page 12? If there´s a serious problem with the reverb and chorus ICs, it´s supposed to show. Yes I did that very early on and it said ok, I haven't done it again since. Those bars are actually pulse waves, you should see them by stretching the time division in your scope. There should be perfectly straight horizontal lines instead of noise. I sometimes get that type of noise on my Owon, bought when the new crop of chinese scopes appeared. It should have been a Rigol I know, but this was cheaper. 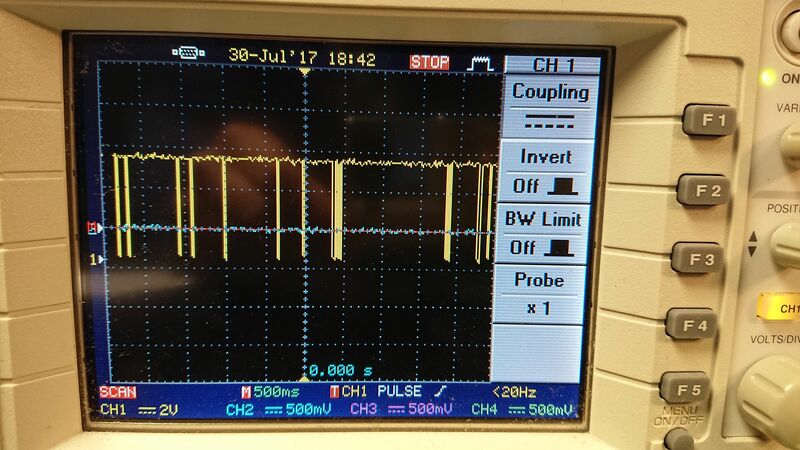 Try connecting a probe to the calibrating square wave signal that comes with the scope and see if the horizontal lines are more linear, to rule them out as traces of external noise instead of something residual. There is a second DAC circuit next to the PCM54. It´s formed by IC11, a quad flip-flop, followed by a resistor ladder network. I think! They decode extra 4 bits and send them already in analogue form to the PCM54 - pin 20 - via some internal feedback resistor. A failing flip-flop could be the source of noise, but could also be switching randomly due to noise in the power supply and inject that noise into the audio... so look for ripple in the PSU and it´s probable cause. Flip-flops are susceptible to noise in the PSU and there should be a choke somewhere on the board that filters it out, when working. Follow the traces with the scope and also with an AC coupled audio probe. Hope this helps, as it´s about to reach a dead end. Good luck! Sorry for my slow reply I didnt see your post until now, I'll do some more investigating with the scope when i have some more time, but since i last posted i saw a genuine NOS spare D50 reverb chip for sale on ebay and got chatting to the seller an ex Roland technical engineer, he told me that there are two main culprits for this problem, most often the chorus chip IC8 which are near impossible to find now and less often but still sometimes the reverb chip IC9 which he had this one selling cheap so i bought it and just swapped it out but the problem noise is still present sadly, i also changed the chorus RAM IC7 and reflowed every solder joint on the mainboard which made no difference either. So besides some more scope work i'm down to hoping that one day i come across a chorus chip or D50 mainboard for sale on ebay. With regards the power supply i've totally recapped it so i doubt its got any noise on it but i'll test to make sure. Was reading a thread on gearslutz called d50 tips and tricks I think. On page 11 theres mention of a possible reason for that noise problem. Im typing on the phone and cant explain it better. Basically it happens after replacing the battery. the solution is to load the pn00 bank and then powering up the unit while pressing bank 2 and preset 6. My d550 is alright but I might try this some time. One other thing is to try some other sysex manager as there could be incompatibilities with newer operating sustems. Presets from known sources such as the roland banks instead of user programmed are a must I think as some of the latter might have too extreme values such as those on the eq which increase noise . Mooger5 wrote: Was reading a thread on gearslutz called d50 tips and tricks I think. On page 11 theres mention of a possible reason for that noise problem. Nice to see you around again Mooger. The post that you reference is potentially helpful in this thread, but definitely fascinating in its own right due to the reverb hacking idea. Thanks for the info! Had no idea it was implemented in that way. Thank you Rasputin and a big hello to the rest of the team. Good to be back although I can´t participate as actively anymore. That reverb thing is indeed curious. And apparently there´s some mention of it in the service manual. Upon reading the other thread I immediately remembered about this stubborn d50 problem from almost a year ago. Not being able to help fixing it has been bothering me ever since! Since the noise can be heard being affected by the chorus, the reverb chip has got to be the offending part. Here´s the last chance to fix that synth. Good luck!